Exhibition design and production for Li Binyuan's project in collaboration with Institute for Provocation/Black Sesame Space. During the exhibition, the artist occupied the larger room in Black Sesame Space, whilst the narrow space showed three previously exhibited video works. 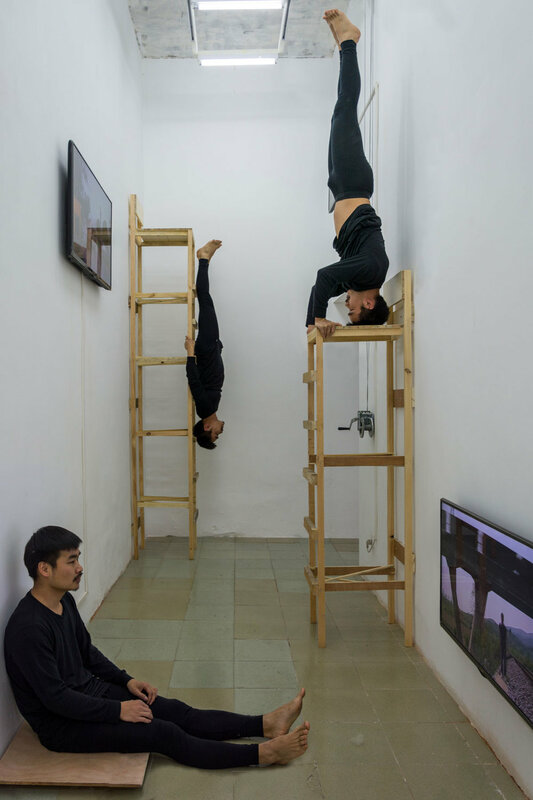 The three monitors were positioned at three different heights (0.5m, 2m and 3m) in the space, and the viewer needed to use their body to find a good viewing position. On the afternoon of 16th April, 2016, the artist Li Binyuan carried out a walking performance through the city of Beijing. The starting point was Li Binyuan’s studio, located in a set of ruins near Heiqiao, and the finishing point was at the Institute for Provocation at 13 Heizhima Hutong. His route wound its way through the urban space of our city, from outside the 5th ring road to inside the 2nd ring road. uring the two week duration of the project, Li Binyuan used Black Sesame Space as his artist studio and temporary home. He brought his own practice, and social life into the space, teetering on the brink of perceived privacy but always available to the visiting public. At the end of the two weeks, he took down the blue sign with the text "Li Binyuan's Studio" from the wall and walked back to Heiqiao where he hung it back on the ruins of the demolished houses where it hung before.